If we believe that God is enough why do we feel like we have to be enough as well? If I go into a shop to buy something that costs £10 and I have £10 note then I have enough to pay. There is no need for me to worry about whether I have any extra money because I know that I have enough. Christians believe that God is all-knowing and all powerful and that he is enough for any and every situation. Ironically, whilst believing this, we can often shy away from things because we feel inadequate or because we don’t feel that we don’t have the resources. If we believe that God is enough, then why do we feel like we have to be good/powerful/skillful/experienced enough in order to do his work? Last night we had a church meeting at Orchard Baptist and I had a full and busy day leading up to it. Around 5pm I said to God something like ‘I’m not feeling 100%, I’m not sure that I am absolutely ready for this meeting, I don’t feel like I am enough but I am willing to trust that you are’. When you ‘let go and let God’, it is incredibly liberating. ‘My grace is all you need. In other words, God power works best when we realize that we aren’t enough and so we have to let him lead and take control. Do you believe that God is enough? If so, are you willing to confess that you are not enough and that you need God? 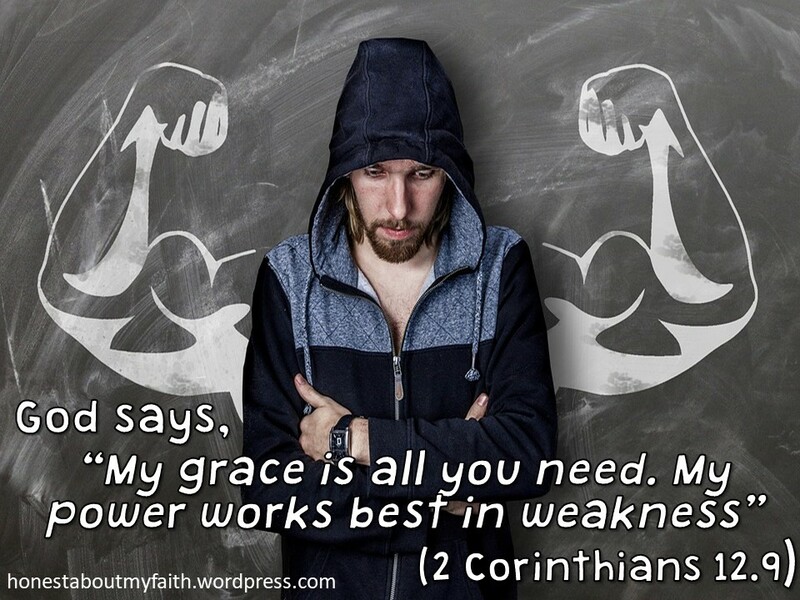 Are we willing to let his power work in our weakness? As I travel through life, I know that God is with me and he is enough. I don’t have to worry about whether I am enough because I know that in God that I have enough for any and every situation. This entry was posted in Faith, God is powerful, God is with us, Life experiences, Power of God, trust and tagged do you ever feel inadequate?, God gives power to the weak, God is enough, god's power is made perfect in weakness, it's normal to have weaknesses, let go and let God, my grace is all you need, power made perfect in weakness, rely on God, what are we relying on in life?. Bookmark the permalink.